Let's face it, not everyone has time to make a delicious cake from scratch. But that doesn't mean you don't want something that looks gourmet at your table. So here's the quick and easy way to make this deliciously decadent cake. - Mix together cake batter, add the vanilla, and bake according to directions. If you want a layer cake bake in two 9-inch pans, otherwise bake it all together. - Boil the 1 cup water and mix in the full packet of Jello. - Frost cake. 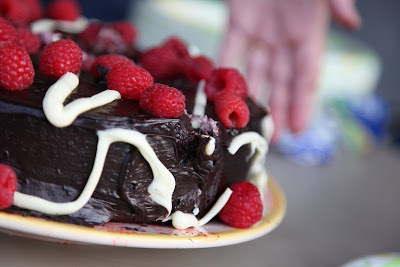 If doing a layer cake frost one layer in dark chocolate, place half the raspberries in, top with the second layer, and frost the top. - Melt the white chocolate and shortening together for 30 seconds in microwave. Stir until completely melted and put into icing pipe or plastic bag (if using plastic bag snip off the end to make pitpe). - Pipe the white chocolate over the frosting in pretty pattern. - Top with whatever raspberries have not been eaten by the kitchen fairies.